Laura said yes to the dress on March 25th, 2017 and got married in September of the same year. The lace gown Laura chose was perfect for her venue and her personality! We love seeing how our brides piece together their accessories on their wedding day! 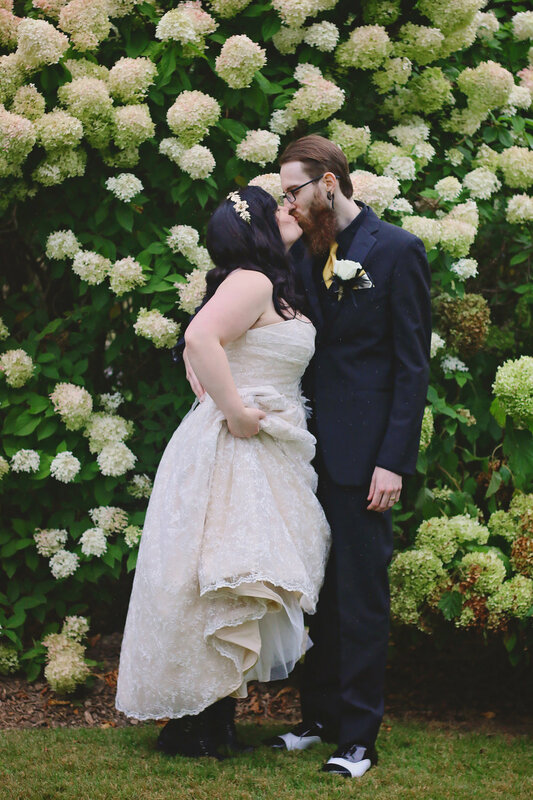 From a belt, to a head piece, to their shoes and Laura made this gown her own! Did you try on dresses before coming to OUTW? About how many dresses did you try on before you found 'The One'? "2 at another place, and 2 others at OUTW." Were you expecting to purchase your dress when you came in for your appointment? "I was ready to buy, but also prepared not to get down on the experience if I didn't find my perfect dress." Who was with you at your appointment? "My entire bridal party, my mom, my big sister, and my groom's mom." Did anyone have extra influence on helping you say yes to the dress? Was the dress you bought similar to what you came in thinking you wanted? How was your experience at Once Upon A Time Weddings? Erin loved working with Laura & her entourage. From the moment she first slipped into that gown, it was like it was made for her. Erin says, "I love how the gown matched Laura's personality and really sprung her vision into life. She stayed true to her and incorporated some fun aspects, like her shoes into her wedding day style. I love when brides do that." If you're still searching for your dream wedding gown book your experience with us online today!